Emotions are important; they help us learn new things, understand others and push us to take action. Do our emotions hold us back? Would we do better if our emotions were removed and we became unfeeling, logical creatures? In fact, emotions are vital to us as they provide us with advantages that help us to lead fulfilled lives. One such advantage is the way emotions help us learn from our memories. When our brain stores experiences, it doesn’t just collect facts. It also records our feelings and these feelings help us to learn from our experiences. For example, if a little boy touches a hot stove, he will experience intense pain. The thought of touching another stove in the future will carry with it the memory of that searing pain. Thus his emotions will hopefully keep him from doing it again. Another value of emotions is the way they help us to interpret the feelings of others, which can aid in predicting their actions. For example, imagine you’re faced with an angry man. From his body language – maybe his clenched fists or loud voice – you can tell his emotional state. Knowing this, you can predict his future actions; he might, for instance, be ready to hit someone. The final advantage that our emotions give us is the drive to act. We require them in order to react quickly to a situation. Take that angry man from the earlier example. If we feel that he may be close to a violent outburst, our emotions will make us feel threatened or even angry, thus preparing us to react quickly if he looked like he was about to attack. People who have lost their capacity for emotion also lose this drive to act. For example, in the previous century, many psychiatric patients went through a brain surgery called a lobotomy, which separated two regions of the brain that are vital for emotional processing. The result of the surgery was that patients lost their initiative and drive to act, as well as much of their emotional capacity. Sometimes our emotions can impede our judgment or make us act irrationally. Emotional intelligence enables you to manage your emotions and leverage them to reach your goals. Emotional intelligence is the capacity that helps you navigate the social world. 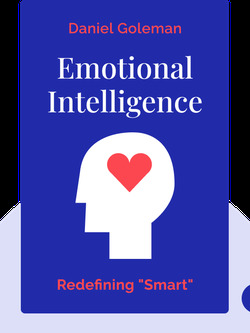 Emotional intelligence makes you healthier and more successful. The future of American society will depend on its children’s emotional intelligence. There are several ways to boost your emotional intelligence. You can use emotional intelligence in all kinds of settings, from the office to your love life. Start your free Blinkist trial to get unlimited access to key ideas from Emotional Intelligence and over 3,000 other nonfiction titles. With bitesize text and audio, it's easier than ever to find the right ideas to transform your life.